I sarcastically yelled in celebration, "Yeeeeee Haaaaw, we got 'em good hun! It's fun going chicken wranglin' with you at 7 am on a Sunday mornin'!" as my 7-month pregnant wife Beck and I teamed up to catch the last two roosters in the coop a couple of weeks ago. Beck replied in embarassment, "Keep it down the neighbors might hear you!" 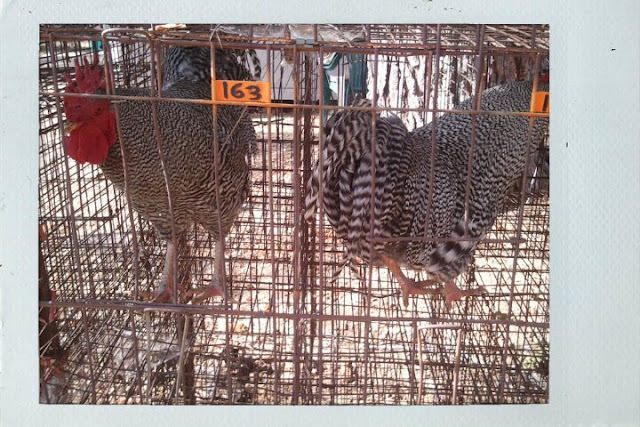 We needed to catch the roosters because I was taking them to the "Valley Springs Poultry Auction." Yes, that is about as redneck as it gets and boy did I enjoy every minute of it. Now catching roosters is no easy task as I found out trying to do it myself, so I recruited Beck to help. Can you imagine a 7-month pregnant woman and a wannabe farmer who doesn't know what he is doing trying to catch roosters in a coop. Yes...people would pay $$$ for that kind of entertainment. Our chicken wranglin' strategy was pretty simple; they kept running under the coop, so Beck had to shoo them in my direction with a 2x4. She soon found that to be too long and heavy, so opted to use a leaf rake instead. I had the task of jumping and grabbing those little varmints as they tried to kick, squirm, and crow their way out of my grip. 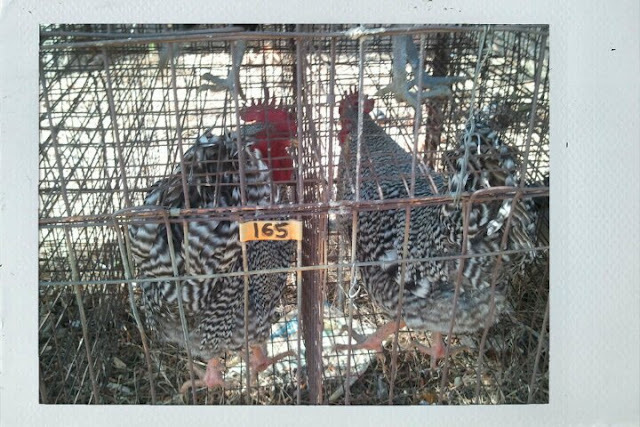 Once I had a hold of them I carried them out of the coop to put them in a dog kennel in the truck. Beck opened the gate to the kennel, I shoved them in and we slammed the door shut as they crowed in despair. Poor little roosters. Well you wouldn't say that if you saw the condition of my hens, who looked like beat up prostitutes in a downtown street alley. The pimp-like roosters needed to go and selling them seemed like less of a hassle than killing them, which was my other option. Killing them and then selling their feathers would have been the more profitable way to go, however at some point I just didn't want to deal with it, so I opted to sell them instead. When my roosters came to me as chicks I was reading about chickens in the book "Raising Chickens." I read that when they grew up I would probably have problems with them fighting with one another. Contrary to what the book said, my roosters formed a four-man gang and did very unpleasant things to our poor little egg laying hens. The sheriff had to kick the gangsters out of town and, just like many real life gangsters, they hid behind their hens, which made it a little challenging to catch them in their coop. 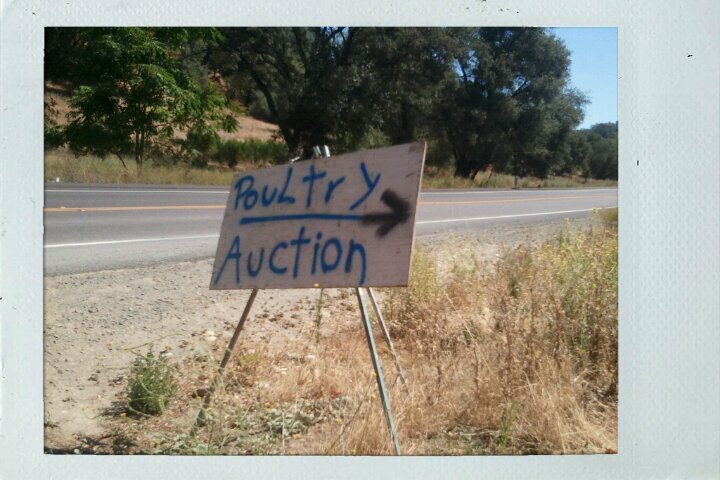 I drove them up a dirt road in Valley Springs following hand made signs to the outback where the poultry auction took place. As you could imagine every outback, hippie, weirdo chicken lover was there either selling or buying chickens, rabbits, doves, turkeys and peafowl. It was a little wild. I did learn a trick up there though as one hen got out of the pen and took off. 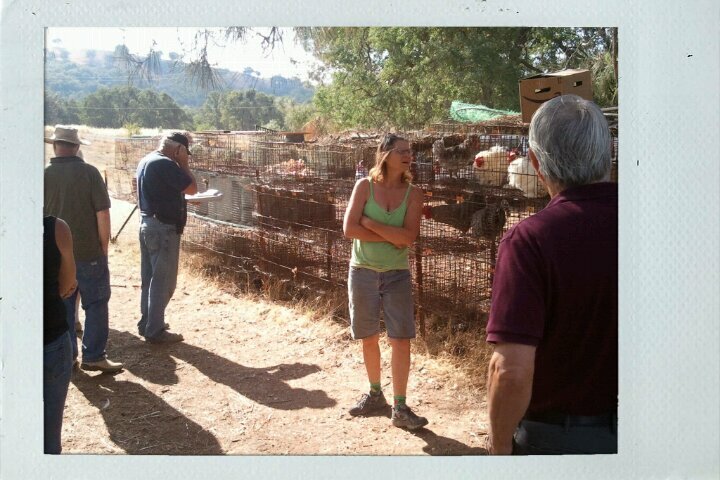 Two people grabbed fishing nets and brought the hen back to the auction cage. I think the next time I go chicken wranglin' I need to invest in a net. I had a great time at the auction and my boys were the best selling roosters there (which still wasn't all that lucrative.) I will admit though, I was a little sad leaving them after the auction. But now there is true peace and quiet on my farm and that makes "this vine life" a very happy life indeed!